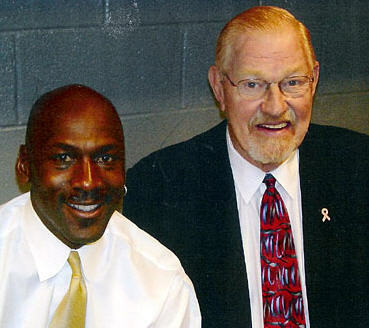 Johnny “Red” Kerr, long-time NBA veteran and Bulls icon recognized for over 50 years of significant contributions as a player, coach, administrator, and broadcaster, was selected to receive the 2009 John W. Bunn Lifetime Achievement Award by the Naismith Memorial Basketball Hall of Fame. Kerr was presented with the award at a halftime ceremony during the Bulls-Pistons game in Chicago Tuesday evening, February 10, 2009. Presenting on behalf of the Naismith Memorial Basketball Hall of Fame was fellow Chicago native and longtime friend of Kerr, Jerry Colangelo. Colangelo was elected to the Hall of Fame in 2004 and now serves as the Hall’s Vice Chairman of the Board of Trustees. “It is only fitting that the Hall of Fame recognizes Johnny Kerr as an individual who has given so much to this game. His legacy will be part of the Hall’s history forever,” stated Mr. Colangelo. In honor of Kerr’s 35 years of service to the Bulls organization, the team also unveiled a statue of Kerr that will stand at the United Center. The Bunn Lifetime Achievement Award was instituted by the Board of Trustees of the Basketball Hall of Fame in 1973 and is the most prestigious award presented by the Hall of Fame outside of Enshrinement. Named in honor of Hall of Famer John W. Bunn (Class of 1964), the first chairman of the Basketball Hall of Fame Committee who served from 1949-1964, this award honors coaches, players and contributors whose outstanding accomplishments have impacted the high school, college, professional or international game. “Mr. Kerr’s career contributions are the epitome of what the John W. Bunn Award Lifetime Achievement Award is meant to recognize. There are few people who have committed their lifetime to the game of basketball as Johnny “Red” Kerr has done. He has touched every facet of basketball and has done so with an unmatched passion, dedication, professionalism, and respect for the game he loves,” stated John L. Doleva, Hall of Fame President & CEO. Kerr’s outstanding career started at Chicago’s Tilden Technical High School and he went on to play at the University of Illinois (Champaign), leading it to the 1952 Final Four. In 1954, he was the sixth overall draft pick in the NBA and played 12 seasons for the Syracuse National’s, the Philadelphia 76’ers, and the Baltimore Bullets. In 1955, he led the Syracuse Nationals to an NBA Championship, and during his career was a three-time NBA All-Star. Known as a prolific scorer, rebounder, and playmaker on the court, he once played in 844 consecutive NBA games. In 1966-67, he became the first head coach of the expansion Chicago Bulls and remains the only coach in NBA history to take an expansion team to the playoffs in its inaugural season earning him “NBA Coach of the Year” honors. After two seasons with the Bulls, he moved on to coach the Phoenix Suns in 1969-70. After two seasons with the ABA’s Virginia Squires front office, he returned to the Bulls in business management and in 1975 took over as the Bulls beloved color commentator, a position he still holds today.